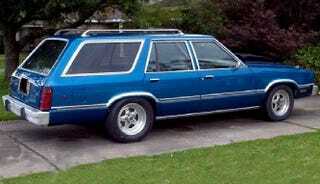 If you consider Drag Racing to be a family sport, and Station Wagons to be family cars, then you'll probably find today's Nice Price or Crack Pipe Fairmont dragin' wagon to be all in the family. Will its price however also in the family way? There are two ways to go through life; you can either be good at a few things, or you can be great at one. There are those who are great at more than one thing but they're just showing off, and mom likes them best. The seller of today's quarter mile-prepped 1981 Ford Fairmont wagon says it's a uni-tasker, good for but one thing, going in a straight line. Upon reflecting on his creation however, I have to disagree, I think this is a longroof with Swiss Army Knife potential. First off, the car, then we'll get around to its multitude of uses, infomercial style. The Fairmont was Ford's ‘70s take on the mid-size family hauler, and it couldn't have been more different in execution from the precedent Maverick than if it had been made out of cheese. First of all, while the Maverick was as coke bottle shaped as a Kardashian, the Fairmont rocked lithe boxy styling that portended a generous interior contained within its modest exterior dimensions. That styling, while not particularly exciting, did age surprisingly well, especially when applied to the five-seat station wagon form. The only real questionable part being the nose which bears an uncomfortable resemblance to Billy Bob Thornton's Slingblade character, um-hum. This one, in electric blue and rocking a roof rack, still sports it copious amounts of brushed aluminum trim and looks to be flaw free from the pictures. Its sleeper character is belayed by a massive reverse scoop riveted to the center of the pin-locked hood. That might make seeing the traffic ahead a little difficult, but the heavily massaged '95 Cobra mill beneath that hump should ensure that there's very little traffic ahead of you. Behind the V8 with its GT40 heads, 650 CFM AED and Flowtech plumbing lies a Pro-Shifted T5 and the ad claims that if you don't know what that is, this ain't the car for you - keep walking, nothing to see here. In case you don't know what that means - and since you're here to judge the car, not buy it - I'll give you the low down. A Pro-Shifted transmission is basically a crash box, having been de-syncro'd in order to speed up the snick-snick between gears. Only in a Pro-Shifted box it's less snick-snick and more WHAM-BAM. The rest of the car has been set up for the strip - 5-lug conversion, armstrong power steering and footstrong brakes plus chassis upgrades to handle all the angry that 5.0 should manage to provide. The ad offers the full litany of upgrades, and it's a long enough list to require Cliff's Notes. Despite all the work, the seller says the car still needs to be dialed in or something, but it looks like most of the heavy lifting has already been done. Now, as I noted earlier, I disagree with the seller that this Fairmont is singular in its purpose. I don't think that the rock crusher box, thirst for 100 octane, or even the plastic rear windows negate this from daily driver use. In fact, its six passenger (assuming it has the bench in front) capacity and large load area make this the perfect Soccer Mom conveyance. Just replace Soccer with Dragster and I think you'll see what I mean. That make it both street and strip worthy, and a total shock that Ashley Force Hood (rowel! rowel!) hasn't already snapped this bad boy up. It can't be the price because Ashley, like all the Forces, likely brings in some pretty sweet bank, and can probably afford this Fairmont's $4,500 asking price. In fact a price like that would likely be within the means of most car shoppers, famous or not. Of course, we're not here to determine could but should, and so it's time to put it to a vote and see if you think this wagon is worth dragging out $4,500 for. What do you think, is this quarter miler worth that kind of cash? Or, is this a dragster dragged down by its price tag? N'awlins Craigslist or go here if the ad disappears. H/T to jamusbullit for the hookup!